OLPC wants to replicate its success in the US in India, but faces logistical hurdles along the way. With 110 million children in the 5-12 age group, India is an obvious target for the ambitious One Laptop Per Child (OLPC) initiative pioneered by tech visionary Nicholas Negroponte. For Satish Jha, President, OLPC India, this will be a second connection with young children; the first happened in the 1980s, when his wife Amita was part of the anti-polio movement in India and saw the number of children afflicted come down from over 600,000 to around 100,000 in a few years. 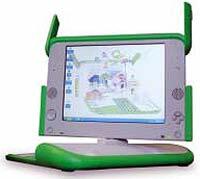 “Similarly, we think OLPC is a vaccination against ignorance,” says Jha. While OLPC in the US gifts one free XO laptop for every branded laptop purchased on online retailer Amazon, the organisation faces a challenge outside the US since laptops won’t be shipped. So, the initiative will now work with Amazon’s UK arm to enable people from India and other countries to propel this project forward. Jha is also pursuing other channels such as corporate sales, corporate social responsibility initiatives, international aid bodies and non-governmental organisations to boost reach. “We want to reach three million children this year and, in five or six years, we expect to set up a much larger national network,” he says. In a power-starved country like India, he sees some of the XO laptop’s technical specifications— solar power, low power utilisation and even a hand crank—as key reasons for the success of this initiative. “We also offer the XO laptop on both open source and Microsoft-based operating systems and our laptops can be used in the open, in broad daylight,” says Jha. Rather than compete with corporate laptop makers, OLPC says it is carving out its own niche in the country. “We don’t want to be bracketed in that league… we hope to enable millions of Indians to get computer literate,” claims Jha. “I feel attached to this idea and am looking to relocate to India from the US to more closely manage the project,” says Jha. Despite his zeal, OLPC has run into rough weather on several counts. For starters, the project, which initially promised laptops at $100 (Rs 5,000), has seen that cost almost double; logistics delays have hampered deliveries across North America; hardware glitches have also slowed the project’s growth.